Trind Nail Balsam 0.30 oz. 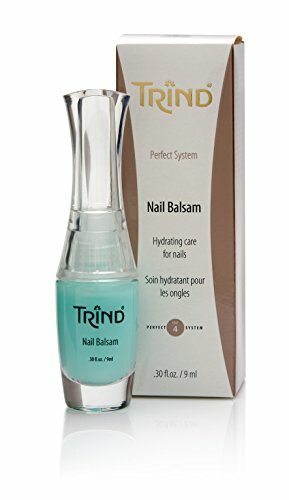 TRIND Nail Balsam is a unique water based balsam for the nourishment of dry and brittle nails. TRIND Nail Balsam restores the natural moisture balance of the nails, caused by a shortage of nail moisture. Characteristics: Where the Nail Magic Buffer makes use of the nail moisture that is already present inside the nail, TRIND's unique Nail Balsam is formulated to be an exact copy of natural nail moisture. This is enabled by the addition of valuable moisturisers, which bring moisture to the nails and keep them moisturized for a longer period of time. The main ingredients in TRIND Nail Balsam are Biotin, Panthenol and Phytantriol. It has proven to support nail growth when used frequently. Instructions: Apply a thin layer of TRIND Nail Balsam onto the nails with the brush. Allow to soak for 1-2 minutes (time permitting). Massage the balsam into the nails, stimulating blood circulation. Wipe off excess balsam with a clean, dry piece of cotton, gauze or cloth. It has proven to support nail growth when used frequently. If you have any questions about this product by Trind Hand and Nail Care, contact us by completing and submitting the form below. If you are looking for a specif part number, please include it with your message. DM9051a Salon and Professional Toe and Finger Nail Fungus Treatment Machine.